I've posted before about my love for false lashes (read it here), but what I omitted at the time was my...um...dissatisfaction with the lash glue. I originally chalked my issues up to being a rookie and being an oily skinned girl and determinedly pressed on. I had issues with how long I had to wait before the glue was tacky enough to adhere, so if you attempted to place it too soon, it would slip and slide across your eyelid...which would conveniently wreck your eye makeup. And even if I got them on without application issues, there was always the concern that the glue wouldn't provide enough hold for longer than a couple of hours. I soon realized that neither of those things were really the cause of my problem, it was poor quality glue. 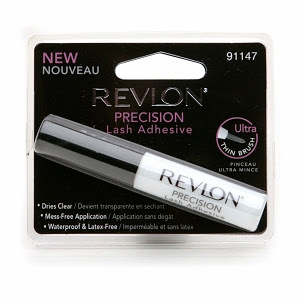 Enter Revlon Precision Precision Lash Adhesive to my rescue! With it's brush applicator, it gives you great control allowing you to coat the spine of the lash and not the lashes themselves and add just that needed bit of extra adhesive to the ends. The product appears white or clear on the brush, but applies in a pretty sparkly blue shade. And there's no need to wait! It's actually best that you don't, in my opinion. You can immediately begin to apply the lash to your lash line and in the time it takes you to finish the application on your other eye, the glue has dried and adhered the lash securely. And don't worry, it dries clear. And let me say that I'm super impressed! The hold felt way more secure than it had ever had before. I feel my first test of the product put it through it's paces - I used it to apply my lashes for a wedding I was attending. It was outdoors, ninety degrees and humid beyond belief. The indoor reception was attended by upwards of 400 people, so the air conditioning felt virtually non-existent. And just so you understand, not only am I naturally oily, but I perspire rather easily... So, I tossed the tube in my clutch, just in case I happened to need it for an emergency lash fix. I ultimately wore my lashes for 8 hours without issue. As I removed my make up they did peel off, but not without quite a bit of tugging and after a day like I'd had, that's saying a lot! I found the tube at Walmart for less than five dollars, so I bought two - just in case I really liked it and it was discontinued before I got another one or in case it dried out too soon or something, I'd have a backup. And if all of that wasn't enough to sell you on it, it's also latex free for any of you divas who have an issue with latex allergies.